This little 4.2 oz bar soap is made of vegetable glycerin. 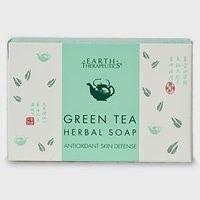 It contains green tea which has antioxidants and vitamins and also rice bran for the purpose of exfoliation. Your skin will be left feeling soft and smelling incredibly delicious after your bath/shower. The company asks that you leave their soap in a clean, dry place when not in use. This will make the product last longer. I absolutely love this soap and I give them 5 stars.